Police arrested a Cambria woman and an Arroyo Grande man last week for burglarizing a Morro Bay hotel earlier this month. Late in the evening of Oct. 11, a female suspect wearing a bandanna over her face entered the lobby of Best Western San Marcos Inn and stole money from the cash register. Other suspects reportedly distracted the hotel clerk from the lobby while the theft occurred, according to the Morro Bay Police Department. Morro Bay officers responded and used surveillance footage to identify a potential suspect. They also collected evidence at the scene. On Oct. 22, Morro Bay detectives arrested Jennifer Goins, 28, and Nikolas Lovato, 27. The arrests occurred after San Luis Obispo County Sheriff’s deputies detained Goins and Lovato during an unrelated investigation. Detectives charged Goins and Lovato with burglary and and conspiracy to commit burglary. The detectives also seized evidence related to the burglary and identified a third suspect. Police have not arrested the third suspect, but charges against the person are pending. The investigation into the burglary is ongoing. Lovato is currently in San Luis Obispo County Jail, according to the sheriff’s office website. He is also charged with violating parole. Goins is not currently in jail, according to the sheriff’s website. Again with the neck tattoos. Please do not post cut and paste off topic pretend “emails” from some “doctor”. We could eliminate crime in society by locking up and throwing away the key those who commit crimes. It is the same people over and over. Oh, but that’s too expensive! Who says they need state of the art facilirties? Bread and water. Hard labor or put them on reality tv for our amusement. Just don’t put the back in society! Of course, the cost of rooms at this hotel will have to be increased to pay for the damages caused by these two thugs. In the meantime, the narcissistic career-criminals and entitlement-mentality parasites of California continue to get a free ride on our backs while the rest of us keep having to pay..
Hmm, according to her facebook page she either worked there at some time or was working there when she robbed them. There is more to this story I’m thinking. 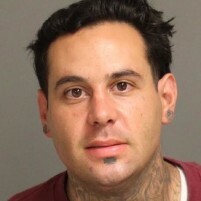 One of Governor Brown’s early release convicts I presume…Get ready because the feds are about to unleash hell on America by releasing low level drug felons like this tattooed loser. Nikolas, if you’re going to commit crimes where there is video surveillance, neck tattoos are a bad idea. It makes it easier for the rest of us to find you and put you back in prison. He obviously didn’t get the point the last time he was locked up. Who wants to bet that these two use heroin? Any takers. With neck tattoos like that usually indicates that someone is an inmate, was an inmate or is going to be an inmate!